I recently secured a small project helping a fellow small business owner update his existing website. That’s right, as a WordPress fanboy I stepped up to the challenge of Joomla. Now everyone knows that the expression “It’s not that hard” often turns out to be famous last words. Just as it’s not that hard to replace a carburetor on your car IF you know how to do it. The same applies to plumbing, electrical work and so on, and so on. It’s my goal in life to keep the services industries alive and well; let me likewise take this time to thank my sincerely dear, sweet father for passing along virtually no mechanical skill. Thanks, Pop! The task at hand was to juice-up the SEO with some on page content tweaks, title tags and descriptions. The un-named webmaster for the website had used single word headlines that were stark and lifeless. It wasn’t Army field manual plain, but still quite vague and non-specific. The mortal enemy of SEO. And to the point of my post title, seemingly nothing is easy to update via a single screen. I was scurrying around from screen to screen managing page elements that were buried under cryptic menus or altogether unavailable. Joomla is probably a fine product and perhaps easy to use (see above). Alas, it’s many WAY-smarter-than-me developers have created a beast with seemingly infinite versions still floating about the inter-tubes. No that’s not an issue exclusive to Joomla, but I’m making a modest point and I can use form of poetic license as needed. 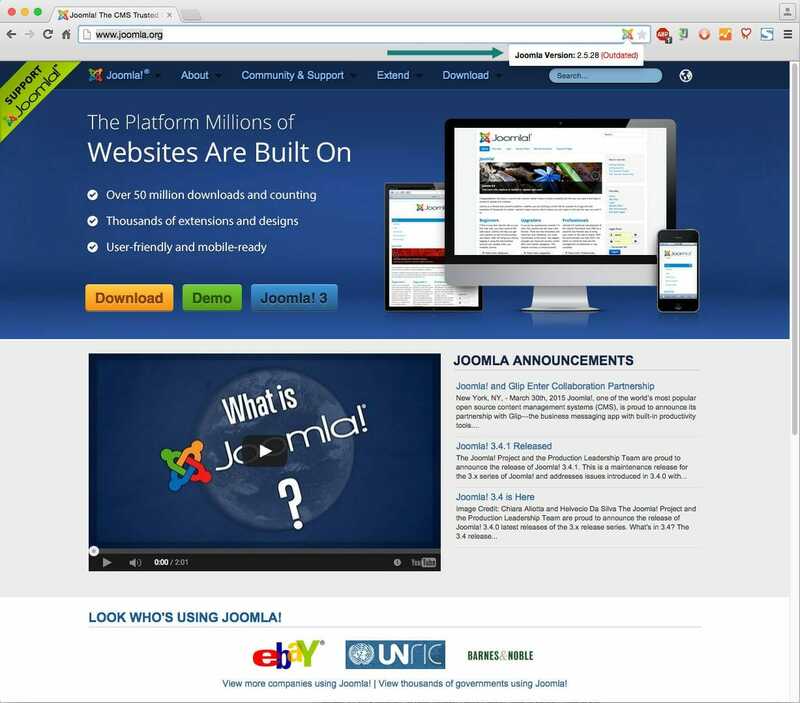 Is Joomla.org using an old, outdated version of its own software? When I went sniffing around the Joomla world in an effort to ease some of the struggles I was having with simply updating page titles and meta information, I visited their homepage to ensure my client was using the most current version. The lifeblood of online security and ease of use. Unlike wine, open source software isn’t judged by how well it holds up over time. Knowing this, I use some handy and occasionally dandy tools that allow me insight into software versions of Joomla and WordPress. VersionCheck is a Chrome extension that does the trick without much effort. According to the fine folks at VersionCheck, Joomla’s own website is using release 2.5.28 (see the green arrow in the right side of the address bar) while the most recent version of Joomla is 3.4.1. For those of you keeping score at home, 2.5.28 is a November 2014 release. Cue the dramatic music. Throwing Joomla under the bus? Yeah, it’s true. I might be getting wonky information from VersionCheck and I trust Joomla more than the extension authors. But perhaps my drawn out point is that website security begins at “home”. No website is bulletproof. Due-diligence demands and dictates that developers and designers (alliteration is fun, eh?) keep their client websites safe via updated and patched software. Using out-dated CMS software is ground zero for hackers and other ne’er-do-well’s that seemingly work 24/7. Looking for exhaustive website support and attention to detail? Give us a call. We’ll chat.